This week has been a great one, but very busy! I worked all week and then my friend from Uni came to stay for the weekend. We had drinks with friends on Friday night, went shopping in Cambridge yesterday and have just been having a good old catch up all weekend! It's been so nice. I also made quite a significant purchase yesterday and bought myself a new camera! My old one broke in Warsaw during a torrential rain storm and with Disneyland and inter-railing coming up, I really wanted to make sure I got a replacement quickly. I was trying to pick between the Olympus PEN E-PL7 and the Panasonic Lumix GF7, but after seeing them the shop, I straightaway knew the one I wanted was the Lumix. It's tiny, has a flip out screen and it's good for both photography and video. It also doesn't break the bank too much! I had the chance to try it out today and I can't wait to take future blog photos with it. Friday night's drinks was my favourite experience of the week. My Uni friend got to meet my home friends and it was just such a lovely evening. It was warm too, so we got to sit outside on the terrace of a local bar. I'm not really into the party scene anymore, so this was an ideal Friday night for me. There were fairy lights on the terrace, which made me think of Disney haha! We had lunch at Zizzi's in Cambridge and their bruschetta was my favourite food this week. It's such a simple dish, but it tastes so good. The Zizzi's in Cambridge is such a beautiful restaurant, it's really open plan and light. Jade (Outside the Tower) has been in Disneyland Paris this week and her Instagram has been full of trip photos. 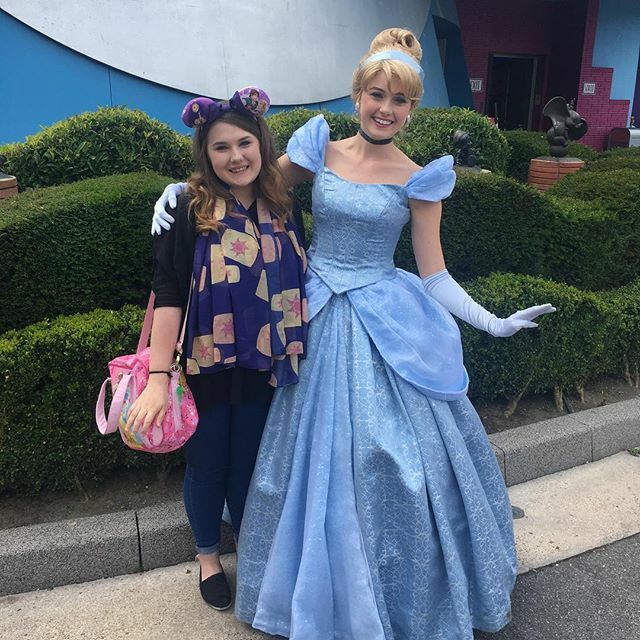 She met so many characters and I've really enjoyed seeing all of her Disneyland Paris updates in my feed. Jade's so photogenic and natural in front of the camera - she always gets such lovely character photos! If you like Disney, you should definitely follow Jade's Instagram. Have you read them yet? They're great posts! I've just bought the Lumix Gf7, so seeing your post has made me super excited to try it out! Aww you're very welcome! :) Your blog is amazing Nicole, you should be so proud of it! Thank you, I'm really happy with it!